Ever since seeing In Win’s unique X-Frame Benching Station, I’ve been really intrigued with their case designs. This year at CES, In Win did not disappoint, unveiling two incredible new products, the D-Frame and H-Frame limited edition cases. The manufacturer also had several power supplies on display. 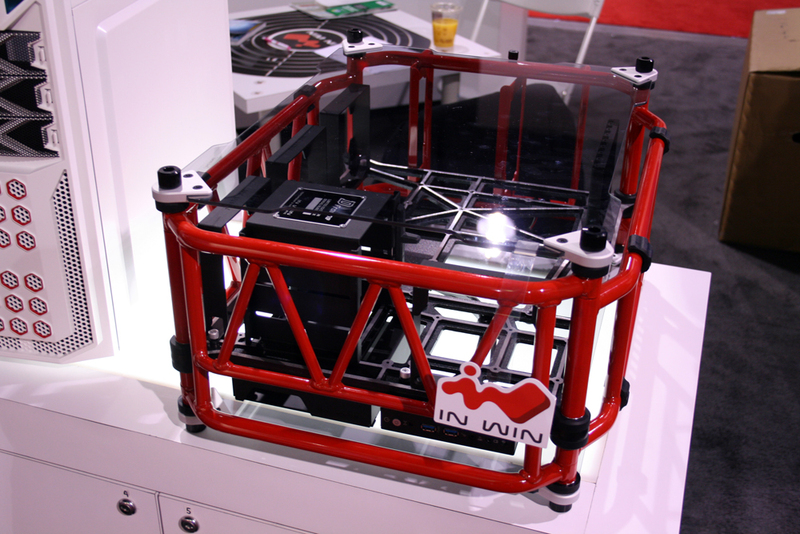 Two of In Win’s cases employ some of the strangest, but coolest designs I have ever seen. 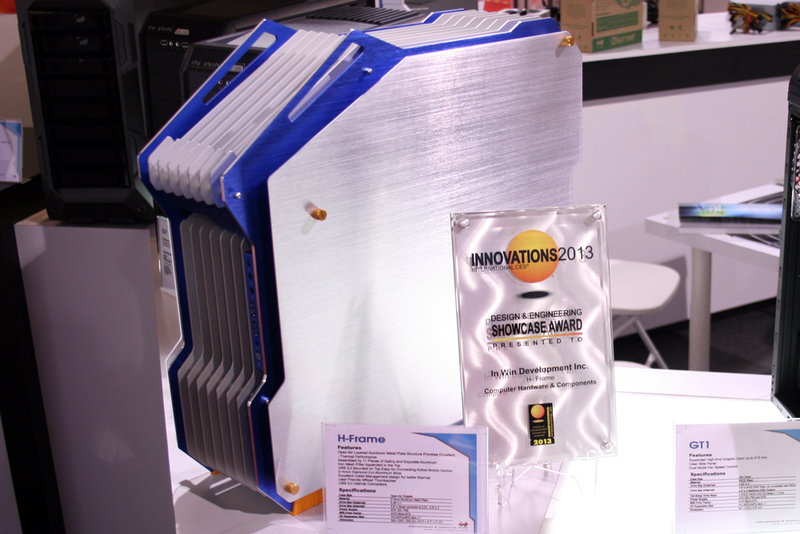 The first is In Win’s H-Frame chassis, which was honored with a 2013 CES Innovation Award. This case was unveiled at Computex, with only 350 being produced, but CES was my first opportunity to check it out up close. The concept is sort of a bare structure, distilling the PC case down to it’s most pure form of just metal. 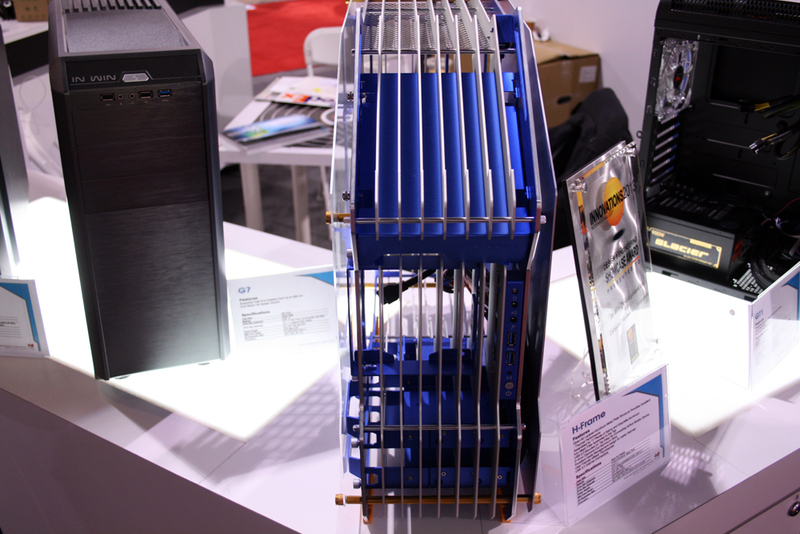 With an open design, the case has many fins allowing for superior airflow. 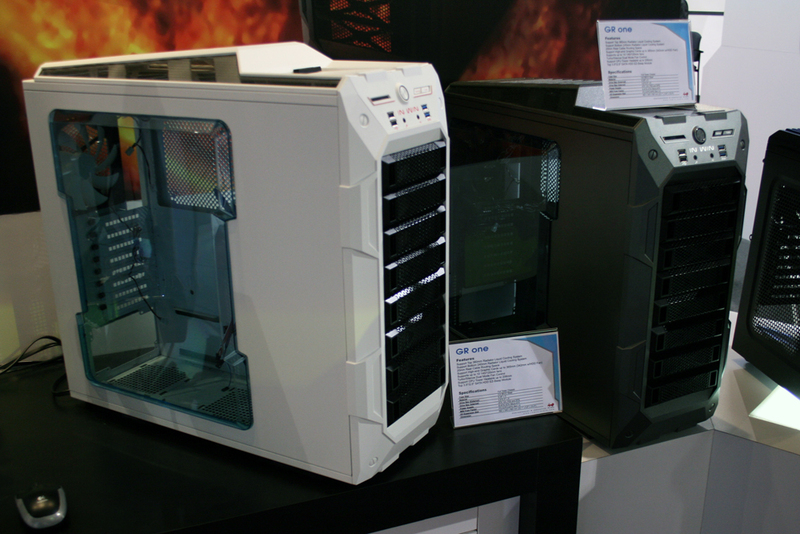 ATX and micro-ATX boards are compatible with the H-Frame, but an ITX version of the case has also been produced. This isn’t really a practical option for most users, more like a concept car at the auto show, but it looks great! 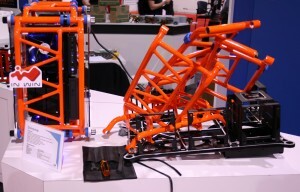 Next up is the D-Frame, also impractical, but again it looks fantastic. This one is styled like a motorcycle frame, also employing the open-air concept of the H-Frame and X-Frame before that. Each aluminum pipe is hand-crafted and custom-welded providing a lightweight frame and strong protection for the PC inside. It will be available in limited quantities, only 500 will be produced, starting in late January directly from In Win. 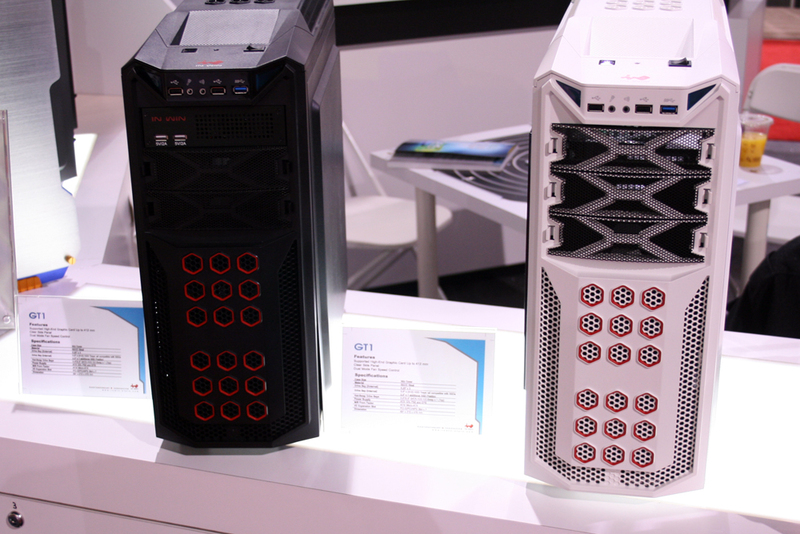 The full-tower GR One cases offers great flexibility for different cooling setups, including space for up to 10 fans and a radiator up to 360 mm. It also has space for large video cards and CPU coolers (up to 206 mm). Plus, it has a fan controller. The GT1 is intended to be an affordable solution for gamers and enthusiasts alike. Long PSU’s and graphic cards fit pretty easily, plus there is space for up to six fans. There is also a side window and integrated fan controller. Last up is the simple, but elegant mid-tower G7 case. This one also has a fan controller and accommodates long video cards up to 408 mm. 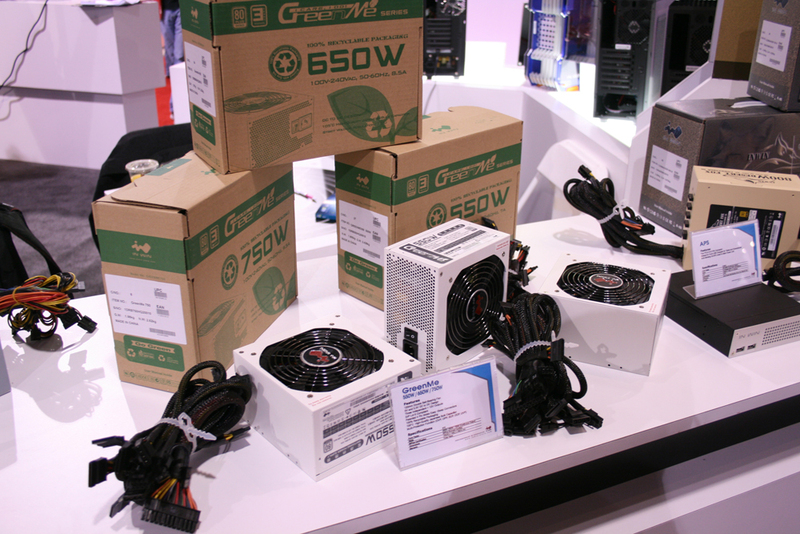 Two power supply lineups were prominently displayed as well, the Commander Desert Fox and refreshed GreenMe family. Even though the GreenMe were released in the spring (we even did a review of the GreenMe 750w) this was my first chance to check them out up close. This line is completely committed to being environmentally conscious. For example, the boxes are made with recycled cardboard and $1 of every unit sold is donated to the World Wildlife Fund. The GreenMe is available in 550w, 650w and 750w varieties. All units are 80-Plus Bronze rated. More recently announced, the Commander III Desert Fox lineup, which was released a few months back. This family of power supplies takes on a military design and is completely designed and built by In Win on 3oz. copper PCBs. All of the units are 80-Plus Gold rated and come with a 5-year warranty. Commander III power supplies are completely modular and feature four 12v rails. 600w, 700w and 800w units are available. Stay tuned for reviews and updates on the latest offerings from In Win throughout the year on Overclockers.com. the white Gr1.... winning! i want one that thing is beautiful. 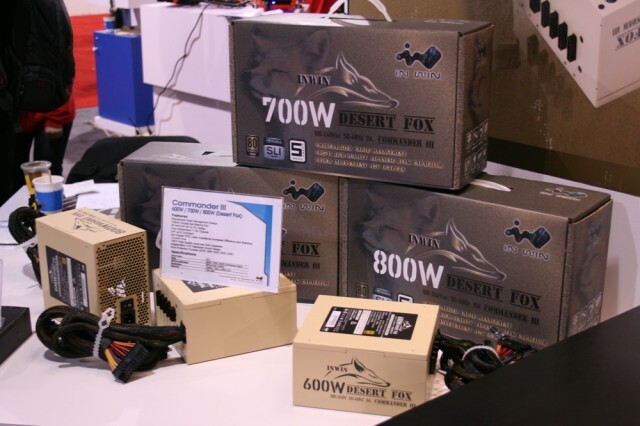 Those desert fox PSUs are hideous. I want one.